Ginni Rometty today marked the 50th anniversary of the IBM Fellows program by honoring eight new IBMers with the company’s highest technical distinction. Only 246 individuals have earned this designation in the company’s history. Eighty-five are active employees. "As we have for half a century, IBM is today honoring its most outstanding technologists and their contributions to computing and society," said Rometty, IBM chairman, president and chief executive officer. "Like all IBM Fellows, members of the class of 2013 are recognized leaders in the global technical community. In 2013, this leadership will be focused on IBM growth markets, where each of this year’s fellows will serve as an ambassador and resource to a different country." These countries include Australia, Brazil, Egypt, Ethiopia, Kenya, Morocco, New Zealand, Nigeria and South Africa. In the past, IBM Fellows, a group that includes five Nobel Prize winners, fostered some of the company’s most stunning technical breakthroughs – from the Fortran computing language to the systems that helped put the first man on the moon to the Scanning Tunneling Microscope, the first instrument to image atoms. In announcing the program 50 years ago, Thomas Watson Jr. said, “We want to recognize outstanding scientific, engineering, programming and systems people who have made a record over a long period of time for sustained achievement. ” The class of 2013 reflects Watson’s vision. Together, they are adding to IBM’s legacy of innovation leadership and laying the foundation for a smarter planet. Click on the photos below and meet the IBM Fellows, class of 2013. Perhaps it was written in the stars. A half century ago, around the time Tom Watson Jr. was unveiling the IBM Fellows Program at a dinner in New York City, on the other side of the globe in Bangalore, Chandu Visweswariah had just entered the world, the only son of a bridge-building civil engineer and baby brother to three brainy older sisters. After nearly two decades in Research, the master inventor, whose five dozen patents in statistical timing and circuit analysis have reaped IBM millions in IP income, moved to Systems and Technology Group in 2009. Today, he leads a 70-person global development team – including 15 technologists at the STG lab in his native Bangalore (now known as Bengaluru) -- that continues to push the art of the possible in chip design, extending IBM’s lead in server performance. A combination of vision and passion. A combination of technical and people skills. A combination of knowledge and ability to question the status quo. A combination of pragmatism and willful abandon. Setting goals that are ridiculously ambitious but not unattainable. Persistence. Diligence. A lot of hard work. The best brains from every part of the world, in every place we do business, what could be better? Sitting to lunch in the cafeteria of the IBM Watson Research Center in Yorktown Heights, NY, is like the "United Nations of ideas" with so many smart people from all parts of the world! What do you look for when you’re adding technical talent to your team? Curiosity. Persistence. Shunners of the beaten path. An attitude that says, "I can do anything. I can master anything. Complexity? Sure, bring it on!" Like solving a crossword puzzle, it needs multiple sittings. Like soccer, you need a great team with great team work. You need to work your way close to the goal if you intend to score. You may need to take many shots at the goal and be willing to fail before succeeding. You need to work it ceaselessly. So I worry a problem to death, and then "put it away" in the back of my brain. A day or two later, in the shower, or while riding my bike, or any other activity that improves circulation, a glimmer of an idea will often take shape! How does your work contribute to IBM’s smarter planet agenda? At one level my work helps make better servers and communications that process the data that are an integral part of Smarter Planet. At another level, the algorithms that we use to solve circuit design problems are applicable to Smarter Planet challenges. Electronic Design Automation (my field) stores and manipulates enormous amounts of data while solving tough optimization problems. We’re the original example of Big Data. I love maxims and quotes, so here's one by John Foster Dulles: "The measure of success is not whether you have a tough problem to deal with, but whether it is the same problem you had last year." Looking ahead, what big advances you foresee in your field? Microelectronics will change form factor and become ubiquitous. What we call "chips" today will be stacked in interesting three-dimensional configurations, worn on the human body, swallowed, or painted on streets or walls. I would like to make my carbon footprint truly zero (with cooperation from my company). I’ve been mentoring a senior at Yorktown High School who is doing an exceptional sustainability project that won her a semifinalist berth in the Intel Science Talent Search competition. I’m proud to say she just became the first student ever from her school to be accepted into CalTech. I want to get more students excited about sustainability. I feel pretty strongly that we are treading on this planet too heavily. Some of things we’re doing will take a long time to reverse. We need to make amends. What are you reading, what’s on the playlist? Just read the Steve Jobs biography by Walter Isaacson. A fascinating book! Been listening to an Indian semi-classical devotional music form called bhajan. I also just got off of Aaron Neville and Emmylou Harris binges! The next time you’re holding your smartphone, eyeing it with an admiring gaze, send a mental “thank you” to Heike Riel. Working out of the IBM Research Zurich lab, the new IBM Fellow figured out in 2003 how to boost the lifetime, color vibrancy, and efficiency of organic light-emitting devices (OLED) so that amorphous-Silicon thin film transistors could be used to make active matrix OLED displays. In simple terms, the practical outcome of Heike’s brilliant discovery – for you and millions around the world – is that your phone displays are thinner, with more vivid colors and broader viewing angles that vastly outperform the previous liquid crystal display (LCD) standard. Just as IBM looked to consumer electronics companies to put this breakthrough into new products, Heike used this opportunity to explore new challenges. She turned her gaze to nanowires and molecules. Heike learned the importance of accuracy, craftsmanship, and an eye for design, while a furniture maker’s apprentice, before going to university. She learned how to build and design everything from bed frames to wardrobes with a keen eye for detail. She ultimately turned her studies to math and physics, but what she learned making cabinets still serves her – and even helped her land an internship with an IBM competitor. “I was the only one of all the excellent applicants who had also learned a craft,” she told the Swiss Association of Women in Engineering after earning their Technical or Scientific Innovation award in 2012. Heike found herself at IBM’s research lab in Zurich as a PhD student in 1998, meeting with Nobel Laureates Gerd Binnig and Heinrich Rohrer, who were behind the Scanning Tunneling Microscope; and Georg Bednorz and Alex Müller, who were behind high-temperature superconductivity. Heike continues to push the boundaries of nanotechnology. Her team’s work in semiconducting nanowires holds the possibility of making the next generation of computers more energy efficient and more powerful – pushing the transistors to the edge of their physical limit. What’s it mean for you to be named an IBM Fellow? It's not only a tremendous honor to be named a Fellow, but also a significant responsibility with regards to IBM's future. Fifty years of IBM Fellows is a milestone of innovation and leadership in an industry that’s under constant change. Being in Research means working on challenges that other people think are impossible. And indeed, our IBM Research team working on organic LEDs had thus bold goals but it was hard to believe – even for us – that we could achieve them. But our small, interdisciplinary team created a seemingly impossible full-color display based on amorphous silicon transistors (that competitors who work exclusively in this field couldn't do at that time). It was a great example of how teams from different areas of the business and different parts of the world (in this case Tokyo, Yorktown, and Zurich) can create something unique. In the lab, you're focused on the problem right in front of you, and sometimes that doesn’t solve a problem. So, I take my mind off the problem by going for a run. My subconscious keeps working on the problem. And inevitably, while I'm out running, the solution hits me. By playing sports, it's almost like I'm letting my brain work independently, without me getting in the way. Another way to spur new ideas is by just talking with others – especially with those who have a different expertise, and different view point. The questions they ask will often bring about a new idea, a different insight, or a new way to solve a problem. First, think about what you like to do. You'll not only want to do it well, but you will study it. You will immerse yourself, and it becomes fun. You're not going to be good at something that you don't like. We need to excite young students about what we work on here at IBM so they’re inspired to work in natural sciences and engineering. For example, I visit schools, or have students come to the lab to talk about the work we do here. I also encourage women who have made it into the field, or working on their Masters or PhD to be confident because they are going to be the minority in this line of work. When you're confident, you don't care that you're a minority. During my apprenticeship I learned how to master all manner of different tools, and to value the importance and the quality of tools. This is true for the tools we work with in nanotechnology, too. You can have great ideas to make nice designs, but until you know your material, master your tools and understand the underlying mechanisms of the technology – you will not be able to make a masterpiece. What’s the last book you read, what’s on your playlist? I'm currently reading "Decoding Reality" by Vlatko Vedral. And I'm listening to Adele, but also enjoy others such as Gossip, Tina Turner (who lives in Zurich), Joe Cocker, and Lang Lang. Long before the iPhone, there was SIMON – a brick-sized mobile phone IBM developed in 1995. While newly named IBM Fellow John Ponzo wasn’t part of developing that original mobile phone, he’s playing an oversized role today in keeping the company at the forefront of mobile enterprise technology. “Look at Facebook: It uses third-party services and apps that tie into their social graph in a sort of ecosystem that connects users no matter how they access the web,” said John, recently named IBM’s CTO and technical leader of Mobile First. In 2008 – the year after Apple released the first iPhone – John’s team started putting business service apps on the iOS store, which in turn revealed additional opportunities in security and data analytics issues that businesses faced as they moved to mobile computing. Fast forward to this year. The need of the mobile enterprise has evolved to needing to tie together not just the software of this hybrid programming, but services, too. Clients wanted entire end-to-end business models for mobile. This need led to another GTO topic on mobile: Mobile First. Now its own brand, Mobile First further broadens what IBM is delivering via mobile, in the form of social, personal, and business data over secure mobile services. Mobile devices continue to expand. The applications can no longer be managed at the device. They have to span any and all devices because the expectation is that it's all going to work together – for example: a heart rate monitor wristband sending a signal to a phone via bluetooth, which then sends a report to a doctor as part of an electronic medical record. What’s it mean to be named an IBM Fellow? I look back at how IBM has reinvented itself over its history. When you look at other IBM Fellows, they were there at many of our major inflection points that dramatically changed technology. I'm excited about being a Fellow at this inflection point of mobile technology as our work on Cloud, analytics and social converge. When Research colleagues from Austin, Haifa, India and Watson started working on some mobile projects in 2007 that focused on collaboration and services, the Lotus team took notice. They were interested in creating mobile capabilities around the collaboration tools they were building. This work expanded to the AIM (application integration middleware) software team to build out mobile platform capabilities. By stretching across the business units like this, Mobile First now doesn't come from one brand; it pulls in capabilities from software, services and research. Our goal – even before we knew it would end up as “Mobile First” – was to reflect the reality that users face. They're not going to think so much about a particular service or middleware, but "What business value am I getting from this mobile product?” Collaboration is why we can deliver these capabilities. Innovation can be nurtured like anything else. Personally, when I really need to think about something, I've found late-night reading and coding to be when I'm most creative. If you like what you're doing, you naturally begin to explore the limits of your work. It’s invaluable to get different perspectives from others about what you’re working on. I try to do both by focusing on end user interaction in the lab, and also observe how end users or engineers interact with apps or entire software systems. From user studies, to informal meetings with colleagues and clients, the goal is not to lose sight of their point of view and experience using software systems. I’m a native New Yorker. Growing up, and didn’t spend much time outside of New York City. Not until I started working for IBM, and moved to the Hudson Valley region, did I really explore the northern part of the state. Now, hiking and biking in the Adirondacks with my wife and three kids is a great way for me to recharge. What’s the last book you read, what’s on your playlist? I’m reading "How to Create a Mind: The Secret of Human Thought Revealed" by Ray Kurzweil, and I'm listening to "El Diablo Suelto" by John Williams. In the world of geeks, the wiz kids always grab the headlines. But this new IBM Fellow – today one of the world’s foremost computer scientists – was a late bloomer when it came to computing. Monty Denneau studied philosophy as an undergraduate at MIT. Only near the end of earning a graduate degree in mathematics from the University of Illinois at Urbana-Champaign, did computers turn his head. With the college circuit contest as a hint of things to come, Monty would go on to design a series of successful machines for IBM, of which his favorite is GF-11 (PDF,518KB) (Gigaflop-11). It was manufactured in 1985 on 576 of what were then the world’s largest multiwire circuit boards. Compute the mass of a proton using a theory called quantum chromodynamics. No machine at the time was fast enough to do this. Working with an IBM physicist, Monty came up with a new kind of machine. Instead of using conventional processors that decided what calculations to do as they went along, he designed a special processor for which all steps of the calculation were determined ahead of time. “It was like choreographing all of the traffic in New York City for a week, so that no car ever had to stop at a red light,” Monty said. GF-11 went on to calculate the mass of a proton (about 1.6 × 10-27 kilograms) and was then used for other scientific problems, such as factoring large numbers, and the multi-physics simulation of the galaxy’s evolution. Monty was also instrumental in developing parallel processing used in IBM's first highly parallel machine, the SP1 supercomputer. IBMer Roger Traub, a neurologist with Research, was doing software modeling of the human brain’s hippocampus. But he could only simulate a small part of the hippocampus on a 1990 supercomputer – and even those simulations could take days. “I thought that if we could build a machine closer in structure to the brain, then we could do these simulations thousands of times faster,” Monty said. The basic idea: build a chip embedded with hundreds of simple processors on it, instead of a much small number of complex processors, as was being done at the time. This would enable calculations to be performed much faster than with any conventional computer. Then, to handle the communication between chips and systems, tens of thousands of chips would be placed in a circle and wired to each other with several tons of cable. The network of this brain machine was soon commercialized in IBM's parallel supercomputer, SP1. In the late 1990s, Monty teamed up with fellow researcher Dennis Newns to simulate protein folding. Monty, then working on a massively parallel graphics machine design, thought it could help Dennis. He called the protein-folding machine Blue Gene. While Monty’s machine was ultimately used for other purposes, the name lived on in one of IBM's most-heralded commercial supercomputers. What’s it mean to you to be named an IBM Fellow? Soon after being hired, I was sitting in my office when I heard some older guy storming up and down the hall yelling about the lousy performance of a new chip. And I’m thinking, who is this guy? Well, he would do this a lot, sometimes for hours at a time. So I started listening and discovered that the guy was really smart. He turned out to be John Cocke, one of the first the IBM Fellows, who also earned the Turing Award for RISC Architecture. One day I had an idea that I thought would help a project he was working on. So, I go to his office and explain it to him. When I'm finished, he tells me it’s an absolutely terrible idea. Needless to say, I didn’t think we got off to a great start. But, soon after, he started coming by my office to talk. The only thing I could surmise was that John thought that someone who could so carefully construct such a bad idea might actually have a few good ones too – maybe. And we soon started working together on several projects. John was fearless and inspiring. He worked on the hardest ideas and problems. In 2002 I was the fourth winner of the IEEE Seymour Cray Engineering Award. John was the first. Now, being appointed into the circle of Fellows, of which he was one of the first, is an especially great honor. I think there’s sometimes this notion that Fellows got to their position because they’ve figured out how to do everything right. This is far from the truth. One thing I wanted to do that never worked out was to build supercomputers under the floor. I had this idea that we could build dense water-cooled computing cubes a couple of feet on a side and put them under the floor. At the press of a button, a cube would robotically make tens of thousands of very high bandwidth connections to its adjacent cubes. The performance of the system would be stunning. Well, no matter what we tried – I dragged in colleagues, friends, even my neighbor across the street – we couldn’t get it to work. Our many approaches just couldn't come up with a way to reliably make the connections. And since the system was water-cooled and inaccessible, one leak would put us in a world of hurt. We finally reached the limit of our imagination and resources and had to give up. I probably lost a thousand hours on this “great” idea. I tend to follow a common pattern. I’ll be working hard on a program and somehow stumble on some unrelated but intriguing idea or problem. A prudent person would just say “no” to this new thing, but more often than not I can't resist the urge to work on the new enterprise. I work really hard, but very often reach the limit of my ability and drop from exhaustion. Then, and it's surprisingly often, a funny thing happens. I'll suddenly wake up in the middle of the night and the solution for the first problem will be right there in front of me – even though I didn't think I'd been working on it. Some may think this is counterintuitive, but an IBMer who is too heavily focused on becoming a Fellow might worry too much about failing because of risks (past Fellows) took. I wish that there were some way around it, but you have to have failures to have successes. The other thing I would offer is this: surround yourself with a network of the smartest and most dedicated colleagues you can find. Being around a lot of such people, who might very well be smarter than you, will go a long way toward helping you be part of greater things. I would not be answering these questions today as a Fellow without having great teams working along with me. I'm currently reading Georgius Agricola's "De Re Metallica" as translated by Herbert Clark Hoover. And I'm listening to a beautiful performance by the University of Utah Singers of Morten Lauridsen's "Sure on this Shining Night." The new IBM Fellow, who established the network science discipline in IBM Research, has shepherded his networking innovations into profitable offerings for System z, Tivoli and other IBM brands. Now he’s in the center of the action in creating a new pipeline of networking technologies that will play a pivotal role in IBM’s mobile strategy. Dinesh, who leads IBM Research’s IT and Wireless Convergence group, doesn’t just hand off his technologies to business units and hope for success. He’s part of every step that brings the technology to market. He has even created new disciplines and established alliances between academics, governments and industries to create several technologies that live well beyond the lab. “I am proud of having contributed to policy-based networking and the establishment of the International Technology Alliance – a group dedicated to Network Science,” Dinesh said. Networks – the set of communication devices that allow us to store files in the cloud, surf the web on our Smartphone, or participate in a social network – are complex. Changing something in one part of a network can unexpectedly and adversely affect another seemingly unrelated part of the network. Dinesh developed policy-based networking as a paradigm to automate the control and validation of network behavior-- saving time and money. In 2006, the U.S. and U.K. governments were looking for innovative ideas to solve networking challenges between coalition forces. Dinesh led an international team of 22 research organizations which was selected to form the International Technology Alliance in Network Sciences. The group’s research has made its way into several IBM products, including Tivoli Netcool/IMPACT, and AIM’s Application & Services Platform for Networks (ASPN). Becoming an IBM Fellow is a dream come true. It is a reaffirmation that my approach to technical innovation is a great match for IBM, and gives me confidence that I can mentor and lead others to achieve technical excellence. In this 50th year of the IBM Fellow program we have a unique opportunity to work closely with emerging geographies. This international collaboration could translate to greater breakthroughs for IBM. There is no canned formula for generating ideas. Inspiration can strike anyone anywhere, anytime. Random discussions with my wife and kids have often inspired ideas for a new patent or paper. IBM offers enormous opportunities to us. It’s up to us to avail ourselves of those opportunities. My advice to IBMers is to try new things and not be disheartened by failures. I love spending time with my family, whether it is just watching a movie, biking on the Westchester County trail way, hiking at a nearby park, or just helping my daughter practice her volleyball. What are you reading, what’s on your playlist? I am currently reading Nate Silver's "The Signal and the Noise.” I like to listen to Hindi songs and bhajans. Jason McGee could be the face for the next generation moving to the front of IBM’s technical vanguard. The 39-year-old rides a motorcycle, loves his iPhone, carries a well-stamped passport, favors trending music, regularly blogs and tweets – and has been at the heart of the development and evolution of WebSphere, one of IBM’s most successful technologies over the past decade. After graduating from Virginia Tech and after a brief stint at HP, Jason joined IBM in 1997 and quickly became an original member and eventually lead architect on the team that developed the original WebSphere application server that launched in 1998. In the years since, Jason has remained immersed in WebSphere as it has become broadly adopted by more than 14,000 clients worldwide. A frequent speaker at industry events and the author of 12 patents, Jason works with major clients across Asia and North America, and his blog has attracted nearly 5000 unique visitors from 82 countries. What do you look for in hiring new engineers? What I want the most is flexibility and self-directedness, people who can deal with ambiguity. You can give them vague instructions and they can figure it out. You can give them high-level guidance and they can fill in the gaps. They are hard people to find but incredibly valuable. You spent 12 weeks last year in Asia and at the China development labs in Shanghai and Beijing. Could you comment on the team there? We have a lot of talented developers and engineers in China, so I have a vested interest to spend time with them. I’m big on getting to know people personally. You have to spend some time face to face. We have a strong and experienced team with an institutional knowledge of how things work and that’s valuable. You started out writing software. Now you lead a global team of 250 engineers working on the PureApplication System. How do you make the leap from “doer” to leader? Early in your career, you own code. You are developing the software that you are shipping. As you grow into a more technical leadership role, your focus is more on architecture and design and leading the team. You have more diverse demands on your time. I’ve tried to stay very hands-on – working on prototyping or using the products as a customer would, for example. So I try to keep fairly close to the code so I know what is really going on. I also spend a great deal of my time now with clients. It’s both expected and it’s essential to doing your job well. I’ve always focused on delivering capability to customers. To do that, you have to spend time with them, understand their problems. It’s a pretty critical part of my jobeven if it does result in lots of travel. What’s your reaction to being named an IBM Fellow? One aspect that’s most validating to me is the way the IBM Fellow and DE selection process requires validation from your peers. They require your peers to say you deserve this position. That requires building relationships across the company with other technical leaders and doing meaningful work together. It’s a great honor to be recognized by them. What’s the last book you read, what’s on the playlist? All through college, Jon Casey had his heart set on becoming a veterinarian. Fortunately for IBM and the future of semiconductor packaging, things didn’t pan out as planned for the future IBM Fellow. With the career detour, Jon spent five more years in Gainesville as a graduate student, eventually earning a doctorate degree in material science before joining IBM’s large cadre of scientists at the semiconductor packaging laboratory in Fishkill. Through his career, the no-nonsense surface chemist with a wise guy sense of humor has been a driving force behind the revolution in processor packaging from ceramic to organic polymer materials. With more than 60 patents to his name, Jon has turned out a steady drumbeat of innovations in semiconductor packaging, a powerful lever for the system performance improvements needed for the high computational horsepower required in the age of Big Data. Jon’s packaging inventions are featured in all IBM Power Systems and IBM System z enterprise servers. What does it mean for you personally to become an IBM Fellow in this the 50th anniversary year of the Fellows program? This honor is the culmination of many years of education and technical contributions and is a testimony that my contributions, as well as my coworkers have been recognized. The honor is not just mine; it is hopefully shared by many. What characteristics do you look for when you’re adding technical talent to your team? I look for people who are independent. I don’t want followers. I want leaders. Occasionally that can create team dynamics challenges. But I want people who are self-sufficient, who want to move forward. The other thing is talent that fills in all the gaps. Everybody is not an expert everywhere. Success can only be achieved through teamwork. What advice would you give IBM technologists who might aspire to become Fellows themselves one day? Look across your business and technical area for opportunities to make contributions beyond what you’re doing. Move to areas you are not comfortable with but feel you can make a contribution and enhance your skills. If you’re comfortable in your job role, it may be time to make a change. With IBM's scope, you interact with experts in all phases of the IT industry. We have more of an end-to-end view than most companies. Our global scope also gives you a chance to work with team members from different cultures and backgrounds and viewpoints. This provides better insight into our global client needs and results in improved products to serve our clients. 1) Keep challenging yourself and 2) Go take some courses in political science and psychology since the world is not binary. In a big organization like IBM, you have to understand human dynamics to make an impact. I usually think of my best ideas when I am relaxing and doing my hobbies – deep sea fishing, woodworking or building or rebuilding things. I once rebuilt an antique bulldozer for kicks and to see how it was engineered. I’m kind of weird that way. I tend to get focused on the tactical issues and challenges while at work and I use my down time for thinking out of the box. "Unbroken" by Laura Hillenbrand. Mostly classic rock music of all types. I grew up in Florida and tend to revert back to my Southern rock roots – Lynyrd Skynyrd, Allman Brothers, all the old school stuff. So you want to throw a dinner party with some interesting conversation? You might invite an authority on global finance, an expert in math and theoretical physics, a Brit, a Canadian, someone who speaks a smattering of French, Italian, German, Spanish, Japanese, Thai and Russian, a former soccer player, a violinist, a cellist, a banjo player and, for good measure, an IBM Fellow. Or you could just invite Neil Bartlett. In 2011, when IBM acquired Algorithmics, a Canadian-based risk analysis firm, the company not only extended its business analytics capabilities for financial clients, it added a multi-faceted, bow-tie wearing Renaissance IBMer to its ranks. As a youngster, Neil distinguished himself in his London grammar school as a frequent science project blue-ribbon winner and a determined player on the soccer pitch. Later, at the University of St. Andrews, Neil earned a degree in computer science and electronics. “I had plans of going on for my doctorate until I talked to my bank manager who told me how much it would cost me. I decided I needed to start working,” recalled the eldest son of a London car mechanic. After working for British Telecom as a network management engineer and performing data mining software development contracting work for several UK-based firms, Neil found his niche when he joined Algorithmics in 1995. IBM acquisition of Algorithmics coincided with the flood of new regulations passed in the United States and elsewhere in the wake of the financial crisis. Algorithmics provides software to help financial firms analyze their risk exposures to fluctuating market prices, assess credit risk and meet a host of stringent regulatory requirements. It’s been about 18 months since IBM acquired Algorithmics. When a firm of 1,000 employees joins a company of 425,000, there can be some culture shock. How would you assess the integration? We came through the integration very well. My biggest fear was we would lose direct client contact. You need to embody client learning and client practices deeply in the software, otherwise you won’t sell it and it won’t be useful. We’re intimately involved in risk management. If I go and have a conversation with a CRO (Chief Risk Officer) in a bank, I will have a very thorough business discussion. It’s subtle, a very different way of selling. We were able to influence that so we have retained our client-facing identity pretty well. That’s been a defining element in the success of the integration. The analytics software you develop is designed, in part, to help firms comply with new regulations. Do you work directly with financial regulators? Over the years, we have been deeply involved with the regulators. We have critiqued some of the regulations from a practical perspective. In some cases, we’ve provided some better ideas. To be in this business, you have to be passionate, dispassionate experts in risk management. You have to be very interested in the topic. We have a lot of people on our team who could have been “quants” on the trading desks for financial firms if they had chosen that path. There’s a certain vocational aspect to it. You have to want to make a difference in how well financial markets function. One is, are they social? They don’t need to be superbly outgoing and the life of the party, but developing things is a social activity. You have to be able to communicate well. Two: There’s a wonderful story about Richard Feynman, the famous physicist, taking a tour of a research facility. He was being shown a complex apparatus and he asked the group of physicists showing him around, is this the anode? They all realized they didn’t know the answer. Feynman was always thinking of first principles. I tend to ask very, very simple questions and then build up. So I might ask, how does the Web work? Or what’s the probability of throwing a six when you roll a dice? They should be able to start from the bottom pieces and build up. Otherwise, I’m very skeptical, particularly if they like spouting their knowledge. Some people will actually be offended by being asked such simple questions. But if you don’t want to talk about simple things, how are you going to talk about complex things? Frankly, I’m a little embarrassed, feeling as I just walked in from outside IBM. I know what I’ve done in my career, but obviously most of that has not been done at IBM. So it’s a real honor to be recognized with such an elite group. We’re going to try to use my fellowship as a platform to bring out the messages around financial risk and the solutions we offer. We tell clients, how you tame uncertainty is how you can manage the future. How do you interact with information, gain trust from it, how do you assess if it’s good information … that’s in a sense what we do in risk management. You need to have a fellow stand behind a message to make it pervasive. Just finished reading “Seasons in the Sun” – a four-part trilogy on the history of England. I’m a vinyl person, so I put on records. I’m a bit retro that way. I’m a big fan of string quartets, but I listen to everything from heavy rock to folk music. If I go digital, I’ll go more modern – The Black Keys, Acoustic Alchemy. Finally, you have dropped 80 pounds over the past year. How did you do it? Human diet recommendations are very difficult. The science is difficult enough, but then it is fraught with politics, commercialism and downright quackery. I read what felt like several hundred research papers and a fair number of books to see if I could uncover a theme. From which I felt the only true way to lose weight was to get keep your blood low in insulin and to ensure that your body quickly removed insulin from the bloodstream when it was not needed. Ultimately, at a very high-level I did a variant on the cut carbs and focus on protein -- the closest is probably what the Dukan diet recommends. I took about nine months to lose the weight and ironically I did much less exercise that usual. The next step for me is the most important: How to maintain the weight loss." From its inception, the Fellows program has celebrated the "wild ducks" of innovation. 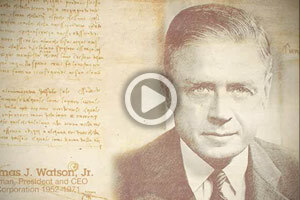 Watch the video to learn more about the rich history.